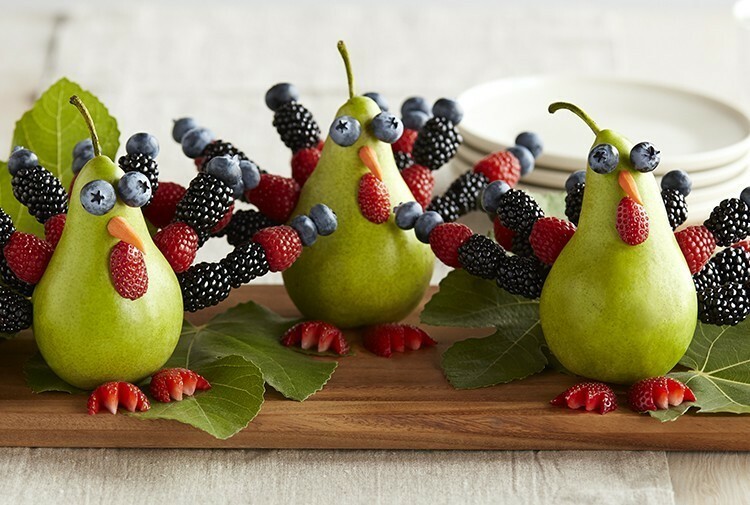 This adorable “pear” of turkeys makes a wonderful activity for the kids to make (and eat!) on Thanksgiving Day! Easy to assemble, Mom or Dad will want to help little ones with cutting and paring, of course! Gently wash and dry all of the above ingredients. Gather the following tools: 24 short (approx. 6 inches long) bamboo skewers, several toothpicks, a paring knife, and a cutting board. Thread berries onto skewers by starting with a blueberry (to anchor the end of the skewer), then adding raspberries and blackberries until all but the last inch of skewer is covered. You’ll need approximately 12 per bird, depending on the size of your pears. Insert your berry skewers across the back of the pear in arcs to mimic a turkey’s tail feathers. As your pear gets waited down on the back, insert skewers at a lower angle to keep the pear standing upright. Once your tail feather skewers are inserted and your pears are steady, it’s time to work on the faces. Using a paring knife, carve two cone-shaped beaks from the carrot (alternatively, you can use the very tips of two whole carrots). Depending on the firmness of your pears, you may be able to attach the “beaks” just by pressing them into the pears. Otherwise, break off a toothpick tip and use it to attach the carrot beak to the pear. Use similar toothpick tips in order to attach two small blueberries for eyes. If trying to avoid the use of toothpicks for care-free consumption, use a plastic drinking straw to carve out holes that are large enough to implant the eyes and beak. For the turkey’s waddle, slice a thin sliver of strawberry and place with the cut side against the pear, just below the beak. The natural moisture of the cut edge will be enough to hold the waddle in place. For the feet, remove the calyx of a strawberry and slice berry in half lengthwise. Use the tip of your paring knife to cut away a few wedges from the thick edge to form claws. Place the strawberry “feet” up against the base of the pear, cut-side down.